Thanks to our friends at the Federation of American Scientists, the recently issued Congressional Research Service (CRS) report entitled Data Security and Breach Notification Legislation: Selected Legal Issues has been made available. 1) 47 US States, the District of Columbia, and three US territories (Guam, Puerto Rico, US Virgin Islands) have enacted data security laws. 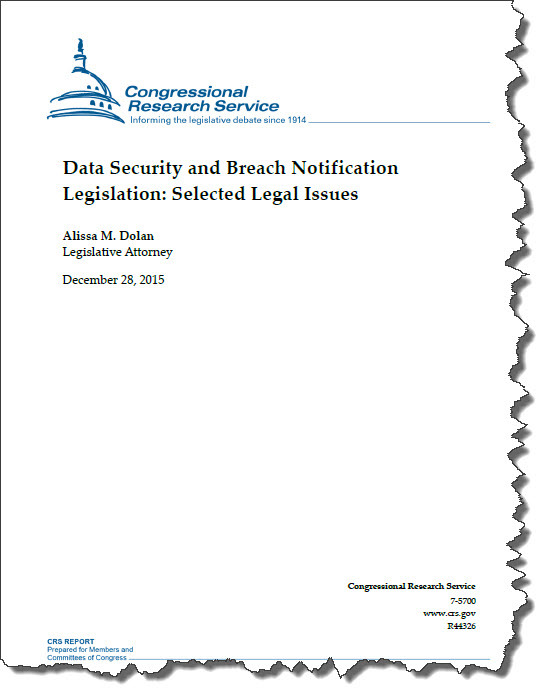 2) Alabama, New Mexico, and South Dakota have not enacted breach notification laws. 3) Massachusetts has issued regulations requiring persons who own or license personal information about a Massachusetts resident to "...develop, implement, and maintain a comprehensive information security program..." (201 Mass. Code Regs. 17.03(1)) Such a program must be in writing and contain administrative, technical and physical safeguards appropriate to the size and type of business, available resources, and amount of stored data. Businesses must also conduct an annual review of security measures. Overall, this is an interesting read on the implications of possible Federal legislation in the domain of data breach laws primarily addressed by US state laws.